J.M. Bergoglio, Homily During Closing Mass for the VI Asian Youth Day at the Haemi Castle, South Korea, 17th August 2014. Digital download or streaming: popefrancis.lnk.to/wakeup Buy the CD: popefrancis.lnk.to/wakeup-presale Official Lyric Video: bit.ly/1MDgHc6 Single included on officially album approved by The Vatican itself. The album includes 11 essential speeches by Pope Francis – e.g. the one immediately after his election as Pontifex - in several languages such as English, Italian, Spanish, Portuguese, Latin. Every speech is accompanied by high quality music. Tracks included in this album face universal principles such as family, children, environment, poverty, etc making the whole album very evocative for listeners. It can be considered a sort of historical document; essential religious speeches are included and addressed to a very targeted and international audience. Good song and melodies, but there is no progressive rock here! Buy Pope Francis: "Wake Up! Go! Go! Forward!" Users who like Pope Francis: "Wake Up! Go! Go! Forward!" Users who reposted Pope Francis: "Wake Up! Go! Go! Forward!" Playlists containing Pope Francis: "Wake Up! Go! Go! Forward!" 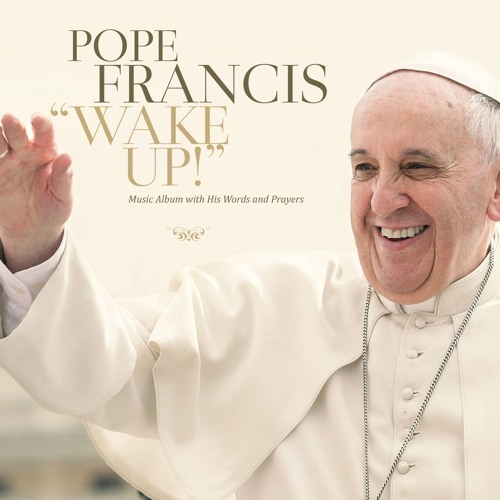 More tracks like Pope Francis: "Wake Up! Go! Go! Forward!"